What happens many hedges? They get ugly! Some of the words used to describe some pretty ugly hedges include: unkempt, scraggly, spindly, and unsightly. Oftentimes people just don’t bother to maintain their hedges, so it’s no wonder they get ugly. When hedges are well taken care of, they can look majestic. Not only do they keep kids/pets in a confined area, away from the street, but they can also shelter birds and help provide food for other creatures in the yard. Rows of hedges help define property borders and boundaries. If they’re going to look good and function as intended, hedges need maintenance, just like anything of value. Have you ever watered, fed and pruned your hedges? In hot weather, it makes sense to get the hose out and water the roots. Come springtime, it makes sense to fertilize the hedges– use a 10-10-10 formula, by the way. Moreover, when certain branches die and/or grow too long for their own good, you need to prune the hedges. With regards to pruning, it’s best to do so such that some sunlight can still get into an otherwise thick hedge. While shearing hedges can be good, it’s better to use bypass hand pruners in order to create spaces in the hedge that let in both air and light. One way to accomplish this and still make the hedge look good is to reach inside the hedge, clipping a branch or two at a 45-degree angle every few feet. Do so just above a nub or leaflet that’s growing, okay? To stimulate new growth, you’ll want to remove up to one-third of a hedge’s thickest stems at the base of the plant. Did you know hedges are ideally pruned late in winter? That’s when they’re still dormant and have yet to produce buds. The top should be narrower than the bottom when shaping a hedge. Keep in mind that the top wants to grow wider because it’s getting the most sunlight, so you have to combat that by narrowing it out so the hedge stays healthy and in good shape. When using shears, shear from the bottom up, making the top the most narrow of all. 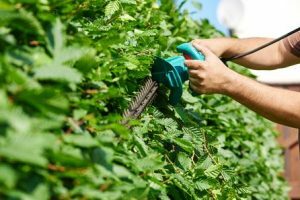 Ideally, you’ll want to keep your hedge trimmed as tall as you are so you don’t have to get out a ladder to reach the far-above-your-head top over the years. Most hedges max out about 6 to 8 feet tall; if it’s lot privacy you want, plant “screen plantings,” including big and tall trees, which can rise some 30 feet. If you live in the Kingwood, TX area and would like professional tree hedge trimming services for your property, contact Forest Tree Service today.